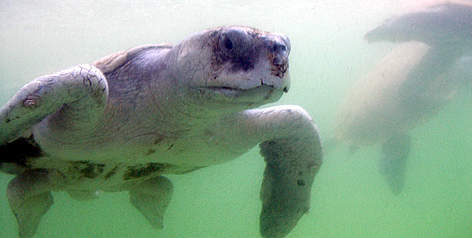 Kemp's ridley turtles can claim the unenviable title of the most endangered of all sea turtles. The species has a restricted range and nests only along a small stretch of coastline in the Gulf of Mexico. A species back from the brink? 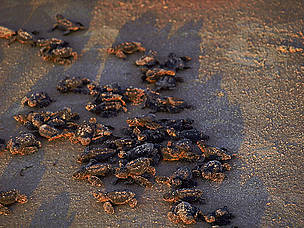 In the 1940s, more than 100,000 Kemp's ridley turtles came ashore in a single day to nest. By the 1980s, numbers were down to a few hundred nesting females. This species does not appear to migrate across open oceans but juveniles move up and down the east coast of the USA between feeding and nesting grounds. Conservation efforts led by USA and Mexico have been ongoing since the 1970s, when the nesting beach of Rancho Nuevo was declared a National Reserve. These efforts have been relatively successful and today there is a female breeding population of between 1,001 and 10,000 individuals. The species differs from the olive ridley by its parrot-like beak and flatter, almost completely round, carapace. Ridley turtles are around 70cm long, and up to 40kg in weight. The carapace (shell) of Kemp's ridley is olive grey, while the plastron (underside) is yellowish/white. Adult females migrate hundreds or even thousands of kms between feeding habitats, mating areas and their preferred nesting beach in Rancho Nuevo, Tamaulipas, Mexico. Adult males appear to be nonmigratory, and stay mainly in coastal waters around Rancho Nuevo. Having reached sexual maturity at around 12 years of age, the nesting takes place during daylight along a single stretch of coastline in the Gulf of Mexico. Like olive ridleys, this species nests in arribadas -'mass arrival' in Spanish. Kemp's ridleys are thought to nest every 2 years, with approximately 3 clutches of about 90 eggs in one season. Incubation lasts about 45 days, and the nesting season extends from March to August, with a peak in May and early June. Characteristically, ridleys camouflage their nests by rocking from side to side after covering the nest, in order to compact the sand and disguise the nest. Kemp's ridleys are carnivores, although the feeding behaviour of the hatchlings and juveniles is not well understood. Adults eat crabs, shrimp, clams, and sea urchins. Juveniles eat small species of crabs, but prefer larger species as they mature. Various factors caused the decline of this species, including near-total exploitation of eggs, slaughter of adults for meat by local people, and fisheries bycatch during shrimp trawling. Today, fishing nets and gear may be its biggest threat yet. Nests of the Kemp's ridley are shallow and poorly disguised, making them relatively easy for human and non-human predators to find. Animals such as coyotes, skunks, and racoons predate the nests, and ghost crabs, gulls, and other sea birds prey on the hatchlings. In addition, this species is locally threatened by pollution. Kemp's ridley turtle is a priority species. WWF treats priority species as one of the most ecologically, economically and/or culturally important species on our planet. And so we are working to ensure such species can live and thrive in their natural habitats. Kemp's ridley turtles feed on invertebrates and may play important roles in both open ocean and coastal ecosystems. 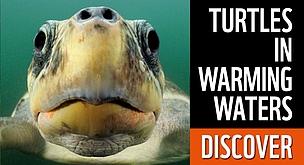 Don't buy products which have been made from sea turtle parts. Guitars, ashtrays, jewellry and other products made from sea turtles are sold to tourists around the world. Nesting of this species occurs conspicuously in broad daylight, and apart from sporadic nesting elsewhere, takes place only on one 20km beach at Rancho Nuevo in Mexico, on the Gulf of Mexico. 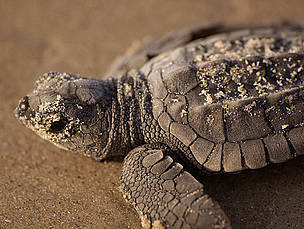 Kemp's ridley turtle is the smallest of all the marine turtle species.